On a chilly May morning, we added a few extra layers and headed back to Flushing Queens to cross the Roosevelt Avenue Bridge over Flushing Creek. Rob and Keith were joined this week by Michael Richter and New Jersey based Bill Halloway from NJUNICYCLE.COM. It was Bill's first ride with the Bridge Tour. Borrowing the Kono's tiny car, Keith used his Eagle Scout training to pack three unicycles into the trunk. The fourth rode down the middle of the car with the saddle on the gear shifting lever. We unloaded the one wheels from the four wheel in a parking lot of school buses. Within moments, we heard screaming children reveling in our rolling past as we entered the Park. 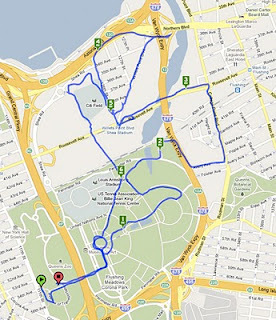 In Flushing Meadows Corona Park, we began by unicyling around the world. Due to larger wheel sizes and continuous training, we were able to go around the world in half the time as our previous ride. From a distance, we saw a good looking small bridge and followed the meandering park paths, always trying to orient in the bridges direction. We found ourselves rolling through a golf course and finally coming upon the bridge only to discover that it was Porpoise Bridge, one we had already crossed. And so, we reoriented and headed to Roosevelt Avenue. The day would be spent crossing many bridges crossed back in March, but the main reason for today's ride still lay ahead. It was important to cross the Roosevelt Avenue Bridge because of upcoming scheduled work on the bridge. In fact, workers were busy surveying the site during our crossing. Once across the bridge we went looking for other bridges over Flushing creek. Knowing that Northern Boulevard is a major thoroughfare we were sure that it would provide a nice pedestrain/cycle lane. We rode over to Northern Boulevard bridge, but couldn't find a safe passage, fearful of the speeding trucks pulling swaying trailers, and narrow lanes leaving no room for one wheelers traveling at 7 mph, we concurred that at least today we would be unable to cross it. The other Flushing Creek spans were even more unfriendly to pedal powered vehicles. Afterwards we cut through auto alley, which, altough it was directly across from the outfield gates of the Mets' Citi Field stadium, resembled in site, smell, and in every other sense the third world. Free range roosters made their presence known. Here to the joy of lookers on we attempted vitual off-road riding dodging pot holes, oil slicks, mud puddles, and extremely rough pavement. Terrain and chaotic traffic patterns provided a constant challenge. Traditional auto rules seemed to be waved in this area, and cars swerved around on whatever side of the road was less treacherous. This four block stretch would be an excellent location for NYC's first MUNI (mountain unicycling) Festival. And probably to the surprise of every "fix a flat" and body shop on the strip, our tires were never punctured and the unicycles remained intact. Afterwards we sought smooth pavement, and for a lack of anywhere better to go, we decided to once again ride around Citi field. Richter stopped to ask a security guard if we could go on the field for a photo on home plate, needless to say, we did not get the photo. Although the NY Citi's (or is it the Mets) were not in the park, bomb sniffing dogs were busy sniffing the rear ends of every vehicle, except for ours, entering the area. A quick ride over the Citifield Boardwalk, we rolled through one of the grand entrances of the old world's fair (1939/40 and 1964/65) site. Back in Flushing Meadows Corona park, we decided to take birthday boy Keith Nelson for a ride on the Carosel. The ride operators allowed us to photograph the unicycles in a carriage, but would not allow the one wheels to ride. The band organ on display seemed to have been replaced by a more modern amplification system, but the sounds were still classic in style. This beauty had torque. So much toque, in fact, that Bill got dizzy. Rob made note of the construction of the carousel that allowed for the horses to swing out and provide a better angle for a rider to stay put. Richter enjoyed the stirrups. And we all wondered that if allowed, would we be able to ride a unicycle backwards on a rotating carousel and not move. Afterwards Bill and Keith treated us to pretzels, and we headed back to the car. Speaking of carousels, in honor of Keith's four decades on the planet, he received his own small carousel. So if you are ever in Hudson and in need of a spin, stop by the Bindlestiff's upstate headquarters. The Roosevelt Avenue Bridge is a double-deck, double-leaf bascule movable bridge over the Flushing River in northeastern Queens. It carries four lanes of Roosevelt Avenue and two sidewalks on its lower deck, and three tracks of the IRT Flushing / 7 train line of the New York City Subway on its top. Surveying for the bridge began in 1913 as part of an extension of the Interborough Rapid Transit Company’s Woodside and Corona line. The original plan had the line mapped out between 42nd Street in Manhattan and Prime Street in Corona, with the extension reaching out to the village of Flushing, with a possible further extension to Little Neck at the city line. The line reached Corona in 1917, but United States involvement in World War I prevented further construction. Financial problems after the war delayed progress still until 1921, when city engineers began negotiations with the US War Department concerning what type of structure the city could build to cross the Flushing River. The War Department, which had jurisdiction over all navigable waterways and their crossings in the country at that time, denied a request by the city to be allowed to build a simple fixed bridge across the river on account of it being an obstruction to river traffic. A tunnel was briefly considered, but was decided against when cost estimates for it reached $2,500,000, more than the city was willing to pay. The War Department suggested the city build a bascule bridge, and officials relented. Groundbreaking for the bridge was held on April 21, 1923 in a ceremony attended by Mayor John Hylan and Maurice E. Connolly, Borough President of Queens. Construction began soon after, though many delays occurred due to a recurring problem with the foundations of the bridge settling in the deep mud on the banks of the river. On May 14, 1927, the bridge was opened to pedestrians and a bus line was established between downtown Flushing and Willet’s Point Boulevard station, the temporary terminal of the line while the foundation issues were being resolved. Train service would not begin across the bridge until January 21, 1928, with a special train for city officials making the inaugural run from Time Square to the new station in Flushing. The extension to Little Neck has yet to be built. The final cost of the bridge was $2,640,000, more than the estimated cost of a tunnel under the river, even when adjusted for inflation. Despite the additional cost the city was required to pay for a movable bridge, the need to keep the river open to navigation did not last long. When construction of Flushing Meadows Park was under way in 1939, park engineers realized a dam was needed to keep the tides of the East River from inundating the low-lying fields. The Long Island Railroad, which runs just a few hundred feet upriver from Roosevelt Avenue, agreed to replace the swing bridge they owned over the river with a combined embankment and tidal gate on top of which they would continue to operate their trains. With no docking facilities in place between the two structures, navigation of the Flushing River effectively ended at the Roosevelt Avenue bridge. In 1961, construction of the northern extension of the Van Wyck Expressway began, and the route of the highway was driven directly through the navigation channel of the bridge, supported over the river by concrete piers. The operating mechanisms and bridge tender’s controls were finally removed at that point, and the bridge has not opened since. The Roosevelt Avenue bridge was the largest trunnion bascule bridge in the world when it was completed. It was designed by Edward A. Byrne and Robert E. Hawley of the NYC Department of Plants and Structures, and built by the Arthur McMullen Company of New York. The channel of the river at the point of the bridge is only 70 feet wide, but because of the skew of the route over the river, the clearance between the bridge piers is 162 feet. Together, the lift leaves are 153 feet long, and each weighs approximately 4 million pounds, supported by a truss structure 25 feet 6 inches deep. The piers that support the leaves are of poured concrete construction, with granite blocks covering the facings exposed to the water. Each pier measures 92 feet by 118 feet, and contains a large hollow space inside to accommodate the movement of the bridge’s counterweights. In January, 2010, the NYC Department of Transportation announced plans to rehabilitate the bridge starting in 2012. Years of neglect have resulted in a need to replace the road deck, repaint and repair rust on the steel truss and approach structures, and repair deteriorating concrete. The city also plans widen the sidewalks from 8 to 10 feet and establish unicycle lanes within them. The project is expected to be finished in 2015. 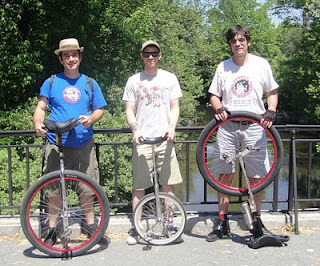 Celebrating Cinco de Mayo we headed to the Bronx with our unicycles to cross some bridges along the Bronx river. 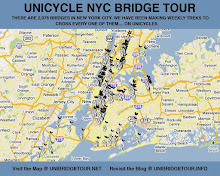 More or less recovered from Sunday's 42 mile ride on the Five Boro Cycle Tour, Keith and Rob took this week's unicyle bridge tour to the borough that was nearly overlooked in the 5 Boro Tour. Only 9 blocks of the 42 miles were in the Bronx. Taking a day off from Ringling Brothers, Hey Ya Brothers, and Richterscale, Michael Richter joined the ride. Sitting upon his 20" Mike made note of his wheel envy. Rob and Keith were both riding 29". Having learned many hard lessons from the long distance ride on Sunday, we slapped on the sunscreen. Soon after we saddled up, we passed a public school. From four stories up and young boy yelled "I hope you fall." We did not respond with a poetic "I hope you fail." 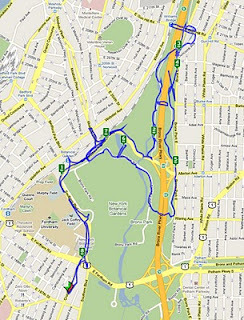 The main targets of the ride were the Bronx River's Park Road Bridge and the Dr. Theodore Kazimiroff Boulevard Bridge. The first two crossings Southern Boulevard Overpass and the Crotona Avenue Overpass over East Fordham Road spilled us onto the outlying edges of the New York Botanical Garden. The sentries guarding the garden all pointed us north along a dangerous blind curved road with virtually no sidewalk or shoulder to get to the nearest bridge they knew of. Next to one of the entrances to the Garden, we came across a sixtyish year old man wanting to give the unicycle a try. He jumped on Mike's 20" and started idling and rolling about. And not to our surprise, he was an ex-King Charles Troupe member. The desire for a sunny day roll along greenways and the river, took us over the Dr. Theodore Kazimiroff Boulevard Bridge and onto a river path that alternated between paved, graveled, and mud. Early into the ride Rob realized that his water bottle had leaked out during a bit of upside down transporting. The path was a gold mine of bridge crossings. Well built bridges spanned what fields of mud and brush. Thanks to a park information sign, we realized we were on the flood planes of the Bronx River. In moister periods these marshlands provide water under the bridges. The mud, wood bridges, luscious trees, and flowing river (really a creek in some of the rider's opinions), allowed for a delightful break from the city. Michael noticed the narrow Duncomb Ave Bridge wall was rideable. With circus concentration, he rode along the edge of a 30 foot drop into rocks, mud, and water. Following cycle paths we came across a span hidden in the woods that led to a gate house. 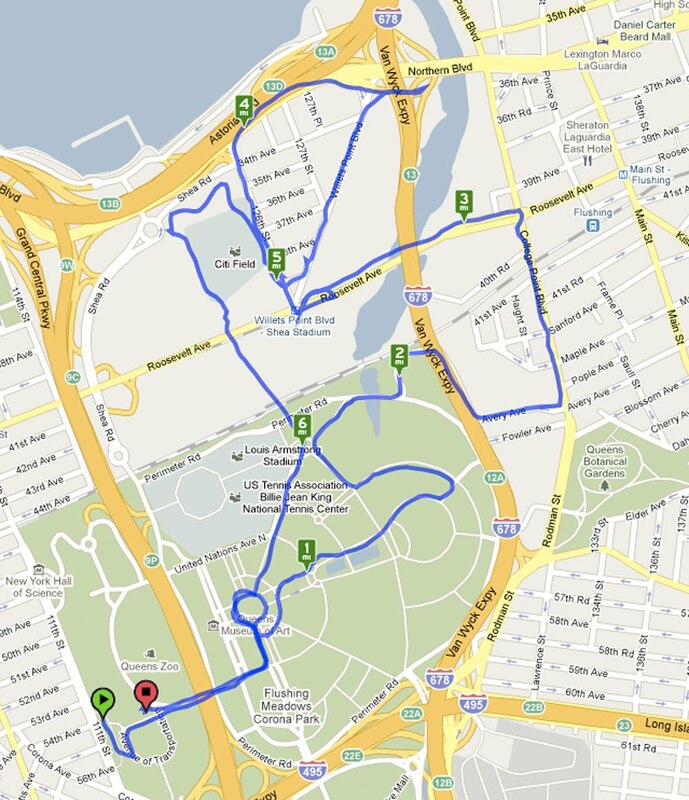 After documenting the span, we were able to find out that we had come to the rear entrance of the Botanical Garden. The guards kindly informed us that bicycles were not allowed into the Garden. We informed him that we did not have bicycles. And we would be unable to lock them to a bicycle rack for two reasons, one that we had no lock and two, that a uni can't fit on a bike rack. We were also informed that baby carriages were allowed and. most important, that the grounds are free on Wednesdays. We said we would push them like carriages and after many attempts, we had finally entered the Garden. Continuing to push the cycles, we came to the Park River Bridge. For this instance, we documented before riding. And in the distance we spotted another bridge being used as a parking lot. And off we rode. As soon as we arrived at this bridge a security SUV appeared from behind the trees and paid close attention to our documenting of the bridge. This well built bridge and historic looking pavement, formerlly the Bronx River Parkway Bridge over Bronx River, had been downgraded and was now used for the simple pleasures of parking. With a security detail tailing our tour, we continued to push the unicycles through the Garden. At the top of a hill we came upon some non-Garden type structures: Windowless buildings, offices, etc. Keith, half joking, said that this must be the Biological Warfare Research area in the park. We soon found out that it was a Pfizer research facility. While pushing through the research area three more security details came into sight and in quick succession made some comment on how we got there with contraband vehicles in the Garden. And the security detail continued to tail us at 2 mph. We stopped to look at a weeping willow and with two more spans added to the tour, we made our way out of the Garden. The realization that NYC's 2078 bridge count is filled with spans crossing rails and roads has forced us to increase the degree of documentation. We will be riding through neighborhoods a second time to capture the overpasses we had let slip. In certain parts of New York, three to four spans can be crossed within a two block ride, making for some record setting rides this summer. 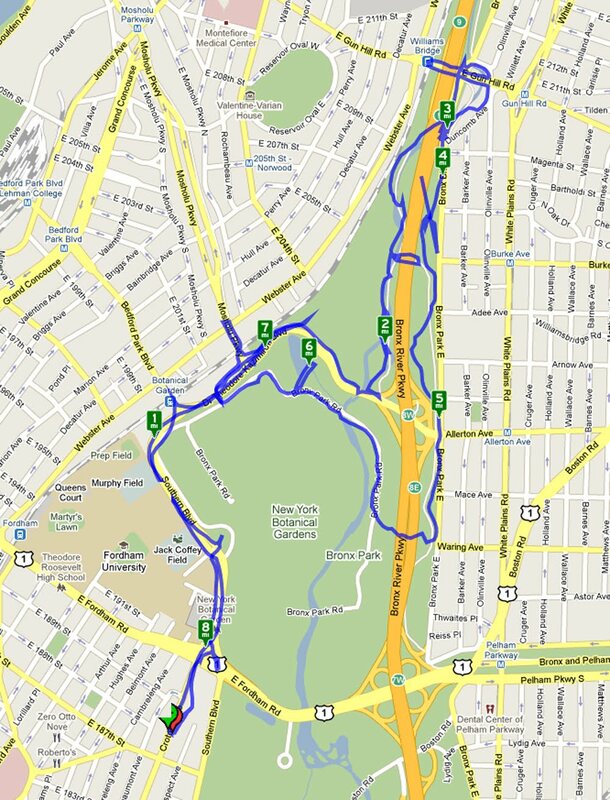 We finished up the Bronx River area and headed to Hunt's Point so Keith could make it to work. He is a Cirque du Monde instructor at the Point. Getting to the Point with fifteen minutes to spare, we headed out to get three more rail road spans. Jason Kahn, Rob Hickman, Keith Nelson, Kyle Petersen (not pictured). Preparations for this epic ride began three months ago. All four riders signed up for the 5 Boro Cycle Tour minutes after the passes went on sale February 1st. The cycle tour is the only day of the year that cyclists are premitted to cross the Verrazano. 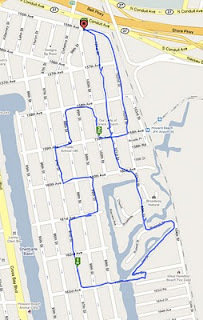 Training involved a weekly 5-10 mile regimen. New unicycles and equipment were purchased. The Verranzano was a long challenging project indeed. The celebration of the ride to come started the night before on South 11th Street in Brooklyn. Jason Vahn of the Hell on Wheels Gang had come to town to get a nice rest and join the one wheel cycle tour. Keith, Rob and Jason spent the early evening enjoying a leisurely sitting on the stoop, drinking Rob's Honey Amber Home Brew, and going over who was carrying which equipment (air pump, patch kit, extra tube, etc.). Rob had purchased a large container of chamois butter and tried to encourage the boys into an early morning group application. 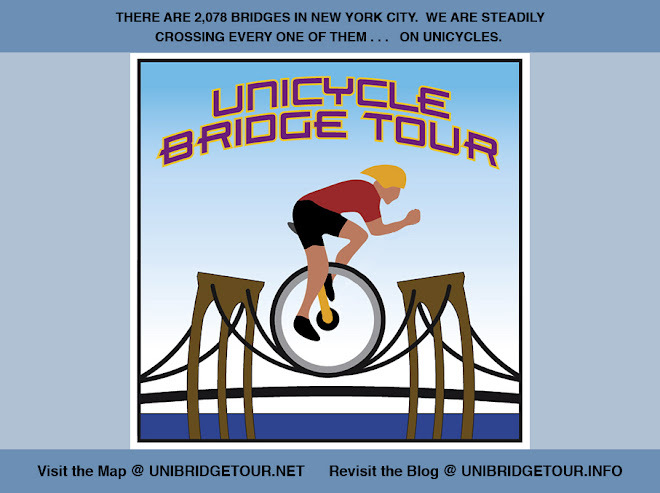 Keith had designed shirts emblazoned with the Bridge Tour web site and the new Unicycle Festival logo. Kyle Petersen came by to pick up his shirt for the next day and enjoy several mugs of brew. 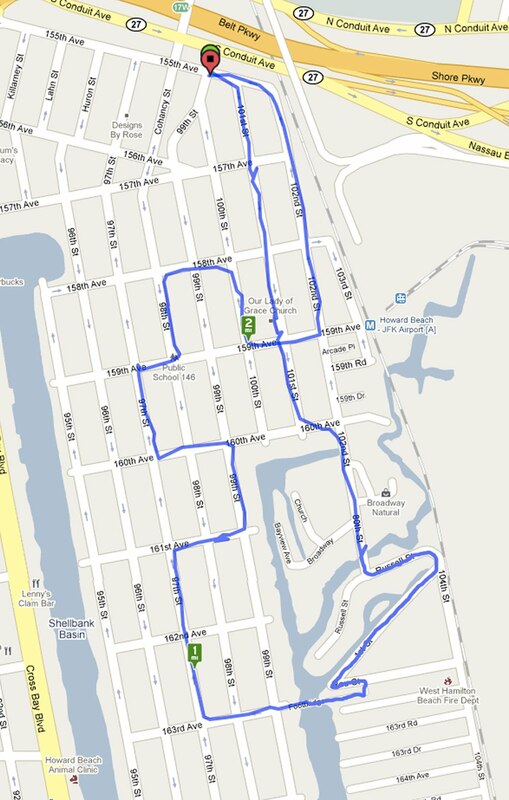 The festivities on Rob and Keith's street were fitting for the upcoming ride. A ground floor loft of hipsters were throwing a barbecue. The cops strode by to ticket one of them for standing on their landing with an open container. The Satmar Hassidic community was preparing to celebrate Lag B'Omer. This ancient ritual had been resurrected in the community only a few years ago. It's main element is the creation of a 30 foot bonfire in the middle of the street. So at approximately 10 pm, masses of Hassadic youth arrived to build the fire. It was obvious that none of these folks had ever been a Boy Scout. When it came to fire building know how, they had very little. Stacking desks, shelves, treated wood, art, couches, foam pillows, police baracades, and just about anything else that had a potential to burn, a height of 15 feet was reached. The Hassidim started arriving in droves. The stack was then doused with gallons of gas (a method that does not require any fire building know-how). A match was lit, and the fire quickly roared. At this point, no cops or fireman were present. Sparks flew in windows, toxic smoke filled the street, the Hassidim chanted and danced around the fire. A group from the Hampshire College Circus Club came by to visit Keith (Hampshire is his alma mater). And they joined into the festivities. Caleb Hickman was inspired by the celebration and rode circles around the fire on his unicycle. Rob greeted Black Label Bike Club riders and convinced them to let him stoke their tall-bike tandem. Twenty minutes later the fire department arrived and started arguing with the Hassidim concerning the toxic 30 foot fire burning in the middle of the street. Eventually the fire department's hoses won the battle and everyone went home. The noisy hipster parties continued throughout the night. The morning of May 2 came hours too early. 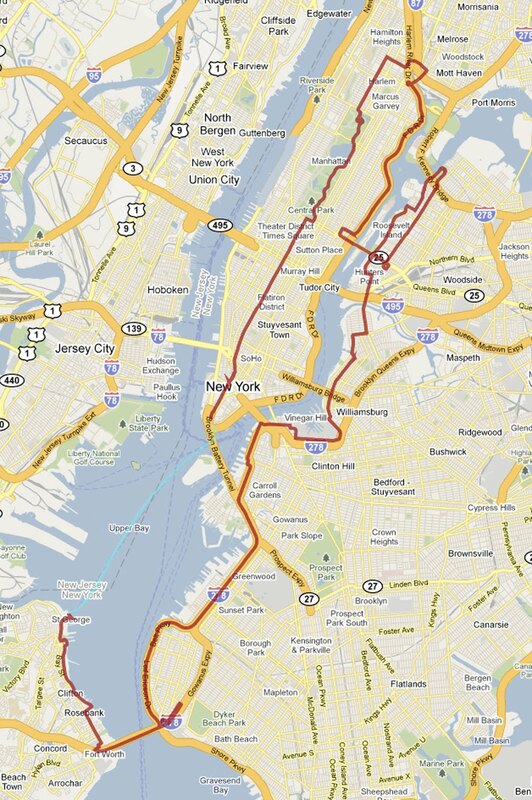 With gobs of chamois butter in their crotches Rob, Jason, and Keith left Williamsburgh at 5:45 am and headed to the Manhattan starting point for the 5 boro. Because the the deli doesn't open until 6am, this departure marked the first bridge crossing that Keith didn't start with an egg sandwich. The trio made thier way into the VIP area for the 5 boro cycle tour at 6:23 am. It was there that we realized that we had not been given "VIP" positioning, but instead were supposed to be corraled a bit more in the pack of two wheelers. As security was beginning to hassle us about not having the correct passes to be in the VIP area the paparazzi surrounded the three of us and started taking pictures of the one wheel wonders. We quickly made our way to the VIP's bagels, fruit, coffee, and other morning delecasises. Once we filled up, we left the area we deserved and made our way back to team up with the fourth rider, Kyle Petersen. And so although near the front, we had been placed in the pack of 30,000+ two wheelers. We were the only one wheelers present at this years ride. Kyle was riding in honor of Maggie Maggie Russo a 2-year-old girl who developed retinoblastoma, a form of eye cancer. Donations to Maggies Fund can be made here: http://maggiesfund.net. Moments before the start, Rob had some mechanical issues that Jason was able to fix. At 8 am Cousin Brucie counted down the start, and off we rode. Up to this point, Kyle had been training with 30 mile plus rides. Rob and Keith were accustomed to 20 mile and under rides, and Jason had never gone further than 9 miles (although these 9 miles were on mountain paths). This was going to be the furthest that any of the four had ever ridden. It was also the the first time the bridge tour team was riding in matching outfits. It was a slow peddle up sixth avenue. Amidst the congestion we noticed numerous bicycle accidents. A tiny mishap was caused by Rob's unicycle. The true blame was in a two wheeler's not only tail gating but using shoes clamped to the bicycle. Many nasty accidents seemed to result from bicyclists clamped to their vehicles. It is a tour people, not a race. Peddaling though Central Park we recognized the many arches in Central Park. It seems like we had just been there. Oh right- we just had. Following a stunning streetside gospel choir recital in Harlem, we crossed over the Harlem River into the Bronx on the Madison Avenue bridge. This bridge we had crossed on a cold winter's day back in January. This time we got to ride in the middle of the roadway. After only nine blocks in the boogie-down Bronx the Manhattan-centic route headed back to money-makin' Manhattan over the Third Avenue Bridge, which we had also crossed in January. Heading down the middle of the FDR, we passed the Randals Island bridge, which had returned to it's crossable down possition. Off in the distance we passed the majestic Tribough. On the FDR we got to ride through our first tunnel. Originally Keith had tried to persuade Rob to include tunnels for an NYC 'Span' Tour. 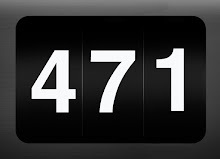 Rob points out that, If this had been the case, the Verranzano would have been knocked back to the 101 position on the official count, instead of the coveted century. Temperatures were in the 80's, hydration was crucial, and the sun was brutal. Three of the four riders sported CamelBak hydration units. Rob was travelling old school with a water bottle strapped to the uni. Only the youngest of the riders went with no sun block. Fair skinned Kyle was working his way towards looking like a lobster by day's end. We headed straight over the top deck of the Queensborough bridge, which was our third crossing by unicycle. Once in Queens, we headed back north to a rest area that had run out of water. Luckily we met Ray Hoffman, a NYC juggler who arrived with water and a video camera. Ray shot this video of our tour's half way mark. For the sixth time we crossed over the Pulaski bridge, making our way to Brooklyn. At South 11th Street and Kent Ave we took a short break to visit with Rob's mom and son Caleb, who begged to unicycle next year's 5 boro. This year's tour took local roads along the Brooklyn waterfront to DUMBO, which became congested with cyclists. We were able to take advantage of the dismounts to relax and stretch our legs. At Alantic Avenue we made our way onto the Brooklyn Queens Expressway for the final stretch to the Verranzano. On the Gowanus Expressway bridge we met a pennyfarthing rider who we traveled neck in neck with us until Cannonball park. Had we documented the Gowanus Expressway bridge crossing, the Veranzano would have been bumped back to bridge number 101. We're planning to repeat the 5 boro ride again next year specifically to document this bridge. On the Belt parkway, Rob was begining to fade. While the chamois butter was keeping his crotch comfotable, his knees and legs were begining to buckle, and he was begining to lose his focus. Rumors had risen that the sweeper trucks and busses were close behind. If the sweepers caught up with you, you would be pulled from the tour. With the onset of a delirium fueled by sun exposure, Kyle became worried and shot ahead of the group to finish the tour and get out of the beating sun. Although he finished 2 hours earlier than the other uni riders, he was completely physically drained by the experience. Because of the separation, Kyle wasn't included in any of the official Bridge Tour photographs. As Rob, Keith and Jason approached Cannonball Park, the last rest area on the route and the final refueling station before the infamous Verrazano-Narrows Bridge, word spread that the sweepers were closing in. "If you wanted to cross the bridge grab a banana, get a water, and get out of the park." And so they did. Seven hours of riding had now put these three riders at the base of the 100th crossing for the Unicycle NYC Bridge Tour. So the trio began the ascent, passing many of the two wheelers who were now walking their cycles over the bridge. Steep and long indeed, the Verrazano did not meet the mythic proportions that had been exepected. At the apex of the Bridge, the trio disregarded the "no stopping/no photo" requirements that had been enforced by Homeland Security and the 5 boro Marshals alike. The trio started the traditional documentation of spans; a photo of the unis on the bridge followed by a picture of the riders and cycles. For the group shot, Rob was able to cajole a Marshal into actually taking the photo. Screaming "we just rode 40 miles on unicycles and we won't leave this bridge without a picture," we were able to get the ride's trophy. Just before 4 pm we rolled into Fort Wadsworth to enjoy the remnants of the 5 boro festival. The three fell to the shady grass as Rob moaned for beer. Kyle had left the festivities and was unable to reenter the grounds to celebrate the triumph. Luckily he had a couple friends who were able to make sure he got home before passing out. Two wheel riders continued to cross the bridge. After a short break, the trio headed for the final leg of the journey. In front of Karl's Klipper Jason bid farewell to make the 7 pm train back to Hudson. Keith and Rob entered for several well deserved pints and a grand plate of gastranomic sustenance. Rob enjoyed a vegetarian power plate of pasta and fries, while Keith went with a rare burger and fries. The Staten Island Ferry ride back to Manhattan was virtually devoid of 5 boro bike traffic. In Manhattan, subway train issues were rampant. After more than an hour's communte, Rob and Keith finally made their way back to Brooklyn and jumped on the uni's for the final ride home. The bridge is named for Italian explorer Giovanni da Verrazzano, the first known European navigator to enter New York Harbor and the Hudson River, while crossing The Narrows. It has a center span of 4,260 feet (1,298 m) and was the largest suspension bridge in the world at the time of its completion in 1964, until it was surpassed by the Humber Bridge in the United Kingdom in 1981. It now has the eighth longest center span in the world, and is the largest suspension bridge in the United States. Its massive towers can be seen throughout a good part of the New York metropolitan area, including from spots in all five boroughs of New York City. The bridge furnishes a critical link in the local and regional highway system. Since 1976, it has been the starting point of the New York City Marathon. The bridge marks the gateway to New York Harbor; all cruise ships and most container ships arriving at the Port of New York and New Jersey must pass underneath the bridge and thus must be built to accommodate the clearance under the bridge. This is most notable in the case of the ocean liner RMS Queen Mary 2. Construction on the bridge began August 13, 1959, and the upper deck was opened on November 21, 1964 at a cost of $320 million. New York City Mayor Robert F. Wagner cut the ribbon at the opening ceremony, which was attended by over 5,000 people. The lower deck opened on June 28, 1969. The bridge took over the title of the longest suspension bridge in the world (previously held by the Golden Gate Bridge) from 1964 until 1981, when it was eclipsed by the Humber Bridge in England. Fort Lafayette was an island coastal fortification in New York Harbor, built next to Fort Hamilton at the southern tip of what is now Bay Ridge. It was destroyed as part of the bridge's construction in 1960; the Brooklyn-side bridge pillars now occupy the fort's former foundation. Each of the two towers contains 1,000,000 bolts and 3,000,000 rivets. Because of the height of the towers (693 ft, 211 m) and their distance apart (4260 ft, 1298 m), the curvature of the Earth's surface had to be taken into account when designing the bridge—the towers are 15⁄8 inches (4.1275 cm) farther apart at their tops than at their bases. Because of thermal expansion/contraction of the steel cables, the bridge roadway is 12 feet (370 cm) lower in summer than its winter elevation. The bridge is affected by weather more than any other bridge in the city because of its size and isolated location close to the open ocean. It is occasionally closed (either partially or entirely) during strong wind and snow storms. The Queen Mary 2 was designed with a flatter funnel to pass under the bridge, and has 13 feet (4.0 m) of clearance under the bridge during high tide. The bridge has fostered more traffic on the Outerbridge Crossing and the Goethals Bridge, both of which connect Staten Island with New Jersey. In 2009, all 262 of the mercury vapor fixtures in the bridge's necklace lighting were replaced with energy efficient light-emitting diodes. The naming of the bridge for Verrazzano was controversial. It was first proposed in 1951 by the Italian Historical Society of America, when the bridge was in the planning stage. After Moses turned down the initial proposal, the society undertook a public relations campaign to re-establish the reputation of the largely forgotten Verrazano and to promote the idea of naming the bridge for him. The campaign was largely the effort of Society director John N. LaCorte, who in 1954 successfully lobbied New York Governor W. Averell Harriman to proclaim April 17 (the anniversary of Verrazano's arrival in the harbor) as Verrazano Day. Subsequent efforts by LaCorte resulted in similar proclamations by governors of states along the East Coast. After these successes, LaCorte reapproached the Triborough Bridge and Tunnel Authority, but was turned down a second time. The manager of the authority, backed by Moses, said the name was too long and that he had never heard of Verrazano. The society later succeeded in lobbying to get a bill introduced in the New York State Assembly that would name the bridge for the explorer. After the introduction of the bill, the Staten Island Chamber of Commerce joined the society in promoting the name. The bill was signed into law in 1960 by Governor Nelson Rockefeller. Although the controversy seemed settled, the naming issue rose again in the last year of construction after the assassination of John F. Kennedy. A petition to name the bridge for Kennedy received thousands of signatures. In response, LaCorte contacted United States Attorney General Robert Kennedy, the president's brother, who told LaCorte that he would make sure the bridge would not be named for his brother. (What had been known as Idlewild Airport, New York's major international airport, was named for him instead.) Even so, the official name was widely ignored by local news outlets at the time of the dedication. Some radio announcers and newspapers omitted any reference to Verrazano, referring to the bridge as the Narrows Bridge, or the Brooklyn-Staten Island Bridge. The society continued its lobbying efforts to promote the name in the following years until the name became firmly established. In 2008 about 190,000 vehicles used the bridge per day on average. As of 2009, the one-way toll (paid westbound into Staten Island only) in cash is $11 per car or $5 per motorcycle. E-ZPass users with New York State transponders pay $9.14 per car or $3.98 per motorcycle; out-of-state accountholders get no discount. From 1964 to 1986, the toll was collected in both directions, until Staten Island residents concerned about pollution from idling vehicles called for one way tolls. However, as of 2009 the eastbound toll booths are still in place, requiring drivers to slow down. While the high cost of the toll between Brooklyn and Staten Island has always been an issue for residents, some favor the toll because they see it as a way to curb population growth on Staten Island. Each of the four bridges to the Island is tolled. Beginning in 2010, eight of the unused Brooklyn-bound toll booths will be removed in a project to improve traffic flow at the toll plaza; three of the unused toll booths will be subsequently removed in 2011 during the second phase of the construction project. Recently, residents living on both ends of the bridge have lobbied for pedestrian access. In October 2003, Mayor Michael Bloomberg promised to look into establishing the long-awaited pedestrian and unicycle access.